Mariano Rivera Last Game Pitched At Yankee Stadium (September 26, 2013). Yankee Manager Joe Girardi Sent Future Hall Of Famer Derek Jeter And Potential Hall Of Famer Andy Pettitte To The Mound To Retrieve Rivera For The Last Time Aat Yankee Stadium. As We All Know, Rivera Melted Into Tears On Pettitte’s Sshoulders, And Then Onto Jeter, Who Uttered The Words, “It’s Time To go.” In All This, Everyone In Yankee Stadium Was In Tears Or Near It. 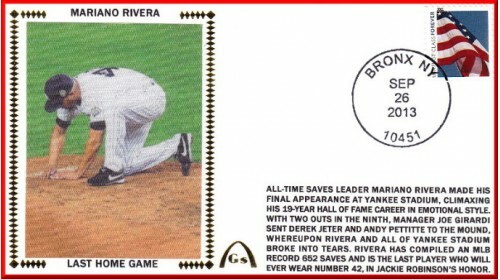 Both Dugouts Continued Giving Rivera The Honor He Deserved, Having Established An All-Time Record 652 Saves With Talent, Dignity, And Humility.